Accompanying the exhibition, we organised a two-day event with the participation of 25 cartonera actors, writers, poets, thinkers and academics from Mexico, Paraguay, Brazil, Argentina, the UK and the US. The encuentro took place on 7-8 November 2018 in the Casa do Povo, comprising a series of roundtable discussions and a reflective workshop around the theme of resistence. Conversations focused on the social and / or political role of a cartonera publisher, the Cartonera book as object and text, and the criteria that cartonera editors employ to choose the works they publish. These meet-up prompted fruitful discussions and debates, which will be invaluable to the research team, and which provided an opportunity for knowledge exchange between the participants. It was hugely important to discover the different cultural processes involved in each one of the cartoneras present at the encontro. I discovered the variety of authors, methods, and techniques (for binding and “intervening” the cardboard) used by different cartoneras, techniques that I have already implemented with 150 children in a primary school in Guadalajara. The roundtable discussions in which we all took part have been useful to gain a better understanding of community work as modes of socio-cultural intervention. As alternative projects that most often emerge as forms of resistance, we simply can’t overlook the activism that unites our countries all around the world. 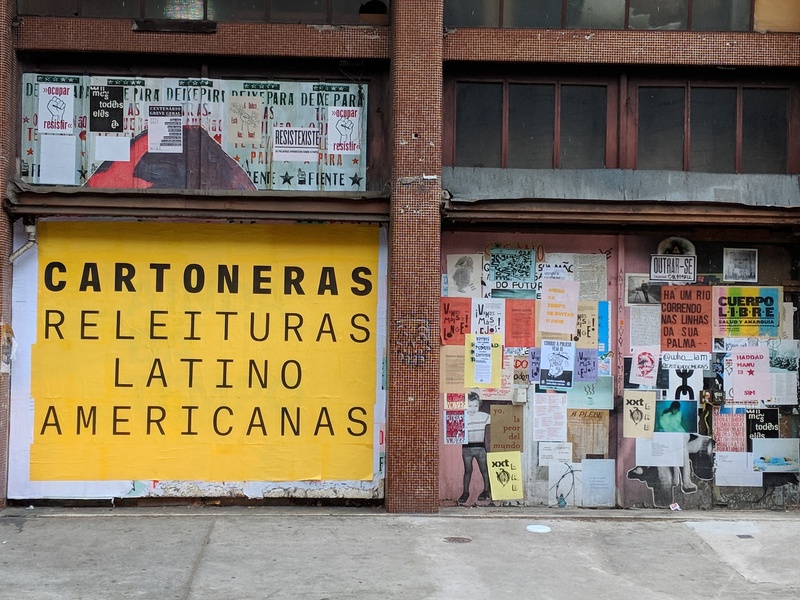 The current political situation in Brazil, and in Latin America more generally, is now a reality that calls for stronger networks of communication, between independent and cartonera publishers, to build capacity for reflection and critique in our communities. […] A big thank you to all the collaborators from Casa do Povo for their hospitality and efforts in putting this beautiful event together. I finish with a thought by Francis of Assisi: “Start by doing what’s necessary; then do what’s possible; and suddenly you are doing the impossible”. I benefited greatly from this seminar by meeting in person many of those who I had only known virtually. This event provided a wonderful space for us to exchange ideas, perspectives, techniques, talk about many aspects of these projects and possible collaborations, and get to acquire cartonera books that rarely circulate. The panel discussions and many one-on-one talks during these two days reinforced to me, once more, the importance of always striving for the upmost of respect in the portrayal of the work done by editoriales cartoneras, the books and contents that they create. The roundtable discussions were pertinent and well-led, producing a good dynamic for serious, in-depth reflections on different aspects involved in the work of cartoneras, all within an atmosphere of respect for diverging points of view. […] I can say that it was an essential opportunity to get to know different cartonera conceptions and trajectories, and, consequently, to forge and strengthen links with the other participating collectives, with whom connections had until then been limited to the virtual sphere. The encontro in São Paulo allowed us to strengthen our links with other publishers: Douglas Diegues (Yiyi Jambo), Fernando Gaudencio Gauderio Villarraga (Vento Norte cartonero), Lúcia Rosa (Dulcineia catadora) and Sergio Fong (La Rueda cartonera). We were able to to discuss further possibilities for co-publications. It is always helpful to know how other cartoneras operate and what contexts they work in. The physical encounters and reflexive debates contributed to our collective spirit, which is why such encontros are so important. We were able to debate, learn methods, appreciate the artistry behind every work, exchange and acquire work to use as examples for our collectives to understand the characteristic of different books from each area. The encontro in São Paulo has led to plans for a further encontro in Diamantina, with discussions under way with a number of Brazilian collectives. We have also initiated dialogue with Magnólia Cartonera on a new initiative in Community Libraries. Participants included Andreia Emboava (Dulcinéia Catadora – São Paulo, Brasil), Cecília Palmeiro (New York University, Buenos Aires), Douglas Diegues (Yiyi Jambo – Asunción, Paraguay), Dany Hurpin (La Cartonera – Cuernavaca, Mexico), Edmario José Batista (Universo Cartonero – Igarassu, Brazil), Eminéia dos Santos (Dulcinéia Catadora – São Paulo, Brazil), Fernando Villarraga Eslava (Vento Norte – Santa Maria, Brazil), Flavia Krauss (Universidade Federal de Mato Grosso), Israel Soberanes Martínez (El Viento – Ecatepec de Morelos, Mexico), Javier Barilaro (Eloisa Cartonera – Buenos Aires, Argentina), Laura Fernández (La Regia – Monterrey, Mexico), Lúcia Rosa (Dulcinéia Catadora – São Paulo), Marc Delcan Albors (Pensaré – San Cristóbal de las Casas, Mexico), Maria Aparecida Dias da Costa (Dulcinéia Catadora – São Paulo), Miriam Soledad Merlo (Eloisa Cartonera – Buenos Aires), Nayeli Sanchez (La Cartonera), Paloma Celis-Carbajal (New York Public Library, US), Sergio Fong (La Rueda – Guadalajara, Mexico), Solange Barreto (Catapoesia – Gouveia, Brazil), Thais Graciotti (Artist – Dulcinéia), Thiago Honorio (Artist – Dulcinéia), Wellington de Melo (Mariposa – Recife, Brazil).